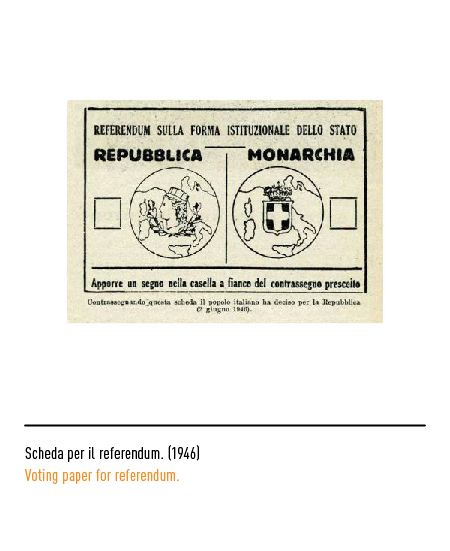 The Republic had been represented on the voting paper for the 1946 referendum by two branches (laurel and oak), surrounding the turreted head of Italy with the peninsula's silhouette in the background. 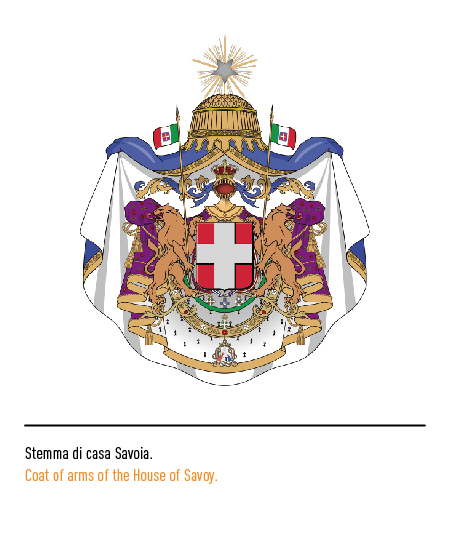 When the Republic was born, the Prime minister's office appointed a commission with the task to create the new ensign of Italy. 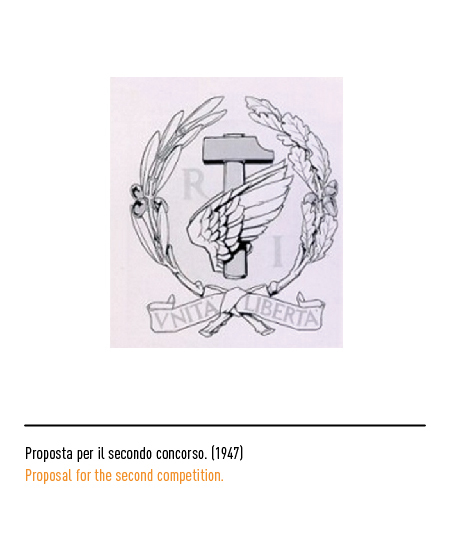 In 1946, the commission decided to extend an invitation to all Italian artists, asking them to create an ensign which would be fit for their motherland: the prize for the 5 best proposals would be ten thousand lire, as well as the task to come up with a final proposal. The drafts had to fit some requirements: << the ensign shall meet the criteria of simplicity, shall be easily readable and easily transposable in sigil form, as well as in watermark form and should be fit to represent the State; therefore, any symbols recalling political parties are to be excluded, since they would undermine the idea of unity and harmony of the motherland. 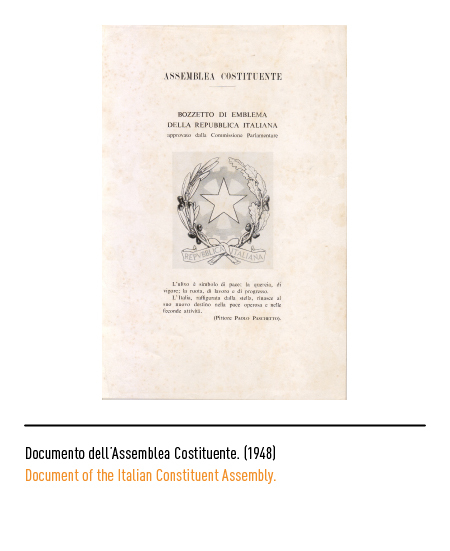 Finally, it has been decided to include the Italian star as essential part of the ensign, excluding any allegorical personification while drawing inspiration from our roots and our communes>>. 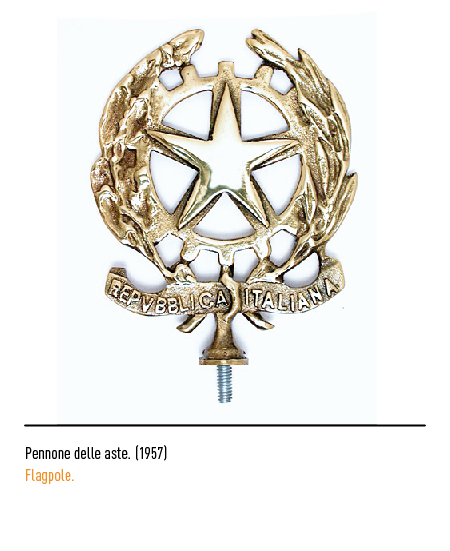 The star is a very old, often recurrent symbol in the Italian iconographical patrimony, mostly appearing together with the personification of Italy, on whose head it would radiantly shine; so was it, especially in the iconography from the Risorgimento until 1890, when it became the famous "stellone" (big star) of the unitary Kingdom. The invitation was accepted by 346 artists, with a total of 637 proposals; all of which were unfortunately very disappointing. The most disparate and bizarre subjects where presented: dancing dolphins surrounded by wheat and turreted heraldic shields, medieval war-altars preceded by victorious trumpets, Phrygian caps, and chimneys, and anvils. Therefore, the commission decided to establish a general topic, and entrust the development of the ensign to a small group of artist who had been noticed through their previous proposals; this caused a progressive stiffness in the elements and a rather small decisional importance for the artists involved. 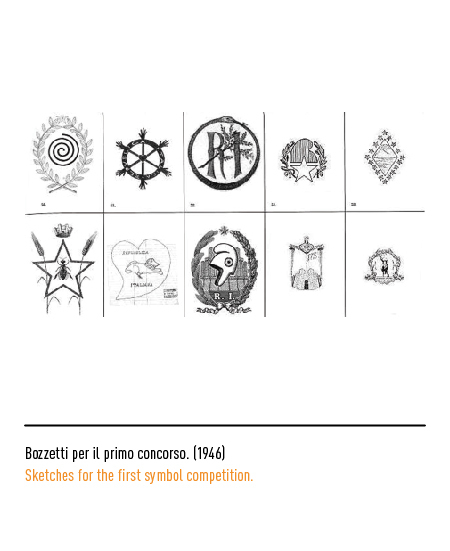 First, 25 artists had been selected; the choice was then narrowed down to 5 (Alfredo Lalia, Cafiero Luperini, Publio Morbiducci, Paolo Paschetto, Virgilio Retrosi). Those artists were then presented with three main requirements: the principal element of the composition shall be a turreted wall, with an open door, which resembles a crown but also a noble construction; this is to make sure it will represent sovereignty, but also the lively image of the architectural traditions of our civilization. 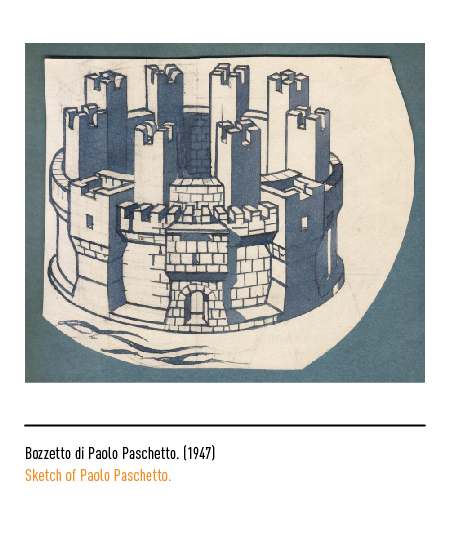 In representing such element, the artist will have – along with complete freedom of creation - to respect the criteria of the technical-heraldic regulation: thus, making it possible to properly distinguish the wall and the turrets. The ensign will have to include, in the lower section, a representation of the sea, to celebrate the natural position and the destiny of the country, while the upper section should feature a 5 pointed radiant star. 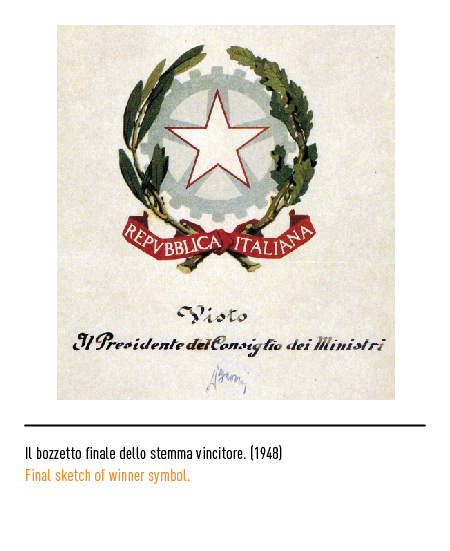 It could also be allowed, if possible, to include the two words which represented the aim of the Risorgimento, and are today engraved in the front of the Vittoriano, but hold nonetheless the same importance: Unity, Liberty. 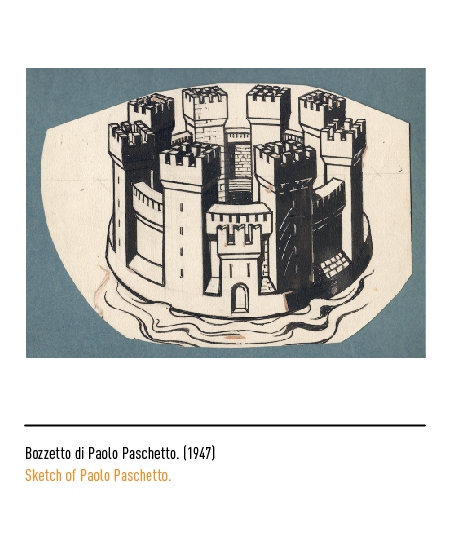 In 1947 the commission analyzed the new proposals, and chose one of the three alternatives presented by Paolo Paschetto; decoration professor at the Belle Arti academy of Rome from 1914 to 1948, he had been a versatile artist, jumping from xylography to graphic, from oil paintings to frescos, from religious subjects to landscapes. 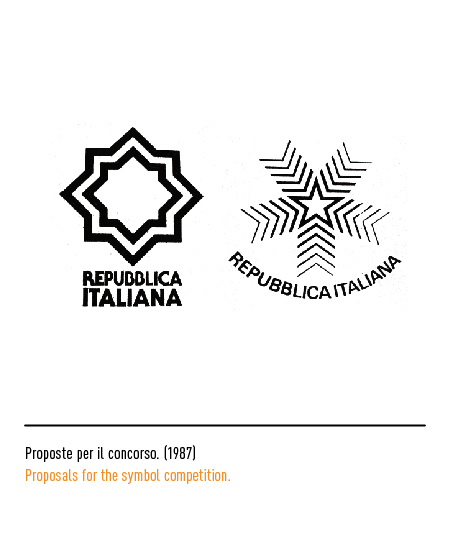 From the submission of the proposal, until the final approval, the draft was changed multiple times, as did the requirements: the characters "Repubblica Italian", previously deemed essential inside and outside the ensign, were now considered superfluous; the rays had to directly emanate from the star; the sea had to take up just a limited amount of space, three lines more distant and with a thicker profile; the plates with Unity and Liberty written on them had to be changed in shape and size; the perspective of the turreted wall was to be heightened. Those modifications were performed together with Cambellotti, one of the most influential members of the Commission. The final draft, submitted together with those from the other 4 artists, was presented at a dedicated art-show which took place at the International Art Society in Margutta street, in Rome. The proposal did not quite convince the press (it had been described as a vat), nor the Prime minister office. 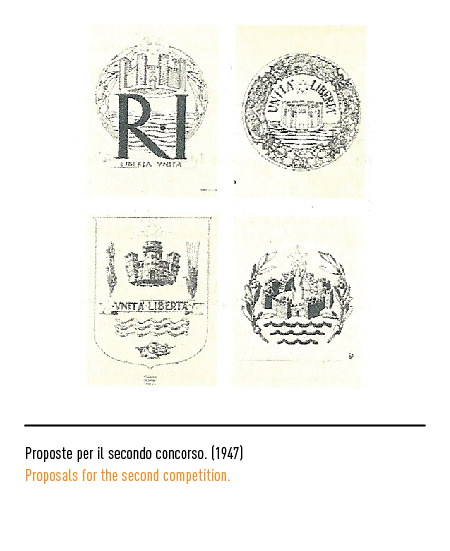 In 1948, a new competition was started, 197 drafts were submitted, by a total of 96 artists who, according to the commission <>. 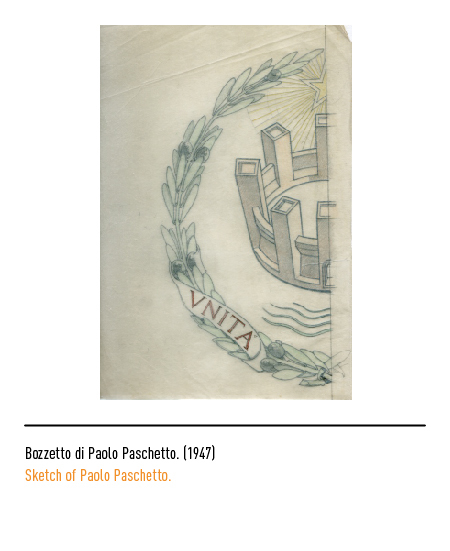 The commission firstly selected 12 proposals, which had been judged best, then decided that the new ensign would be the one submitted by Paolo Paschetto, the same artist chosen by the previous commission. Fun fact: in the beginning, the heraldic office had declared the two branches should be of oak and laurel because of their meaning (eternal glory); the laurel was after substituted by the olive branch to represent peace, but it was misinterpreted by some as a symble of "eternal peace". 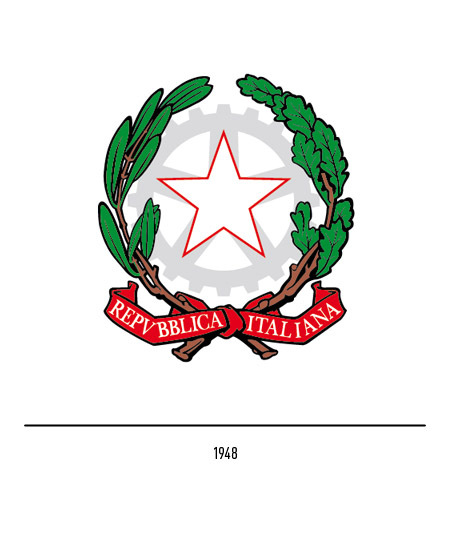 The Constituent Assembly then approved the ensign with these features: a white five-pointed star with a red contour, imposed over the rays of a steel cogwheel, in between two branches of olive and oak, bound together through a red ribbon, bearing the white characters "Repubblica Italiana". 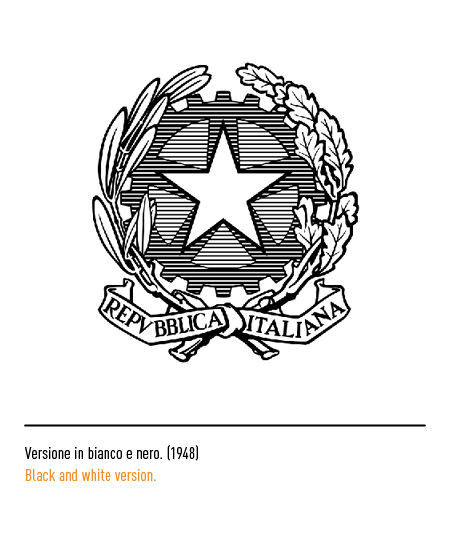 For some, the ensign of the Italian Republic has the aplomb of the ensign of great States; on the other hand, for the majority of graphic designers, it is simply a complicated symbol: it is not synthetic, nor easily readable, it's difficult to define when its size is shrunk, and basically needs a total re-style; proof of this is in the attempts to change it throughout the years, which have not yield positive results. 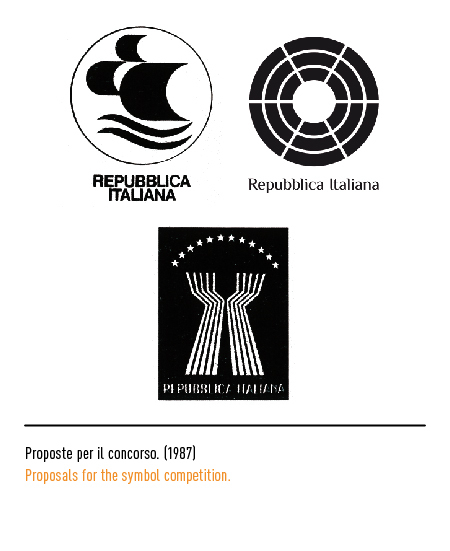 In 1987 a new competition was set up, to modernize the ensign, with a prize of ten million lire. Out of the 239 drafts submitted, 114 created great embarrassment among the members of the jury (which was presided among others by Portoghesi, Testa and Eco): boots, sails, small tricolored man, Swiss valleys, Valdese valleys, a stereotyped and predictable bunch which was easily mocked by journalists. None was chosen, and the ensign stayed the one of Paschetto. 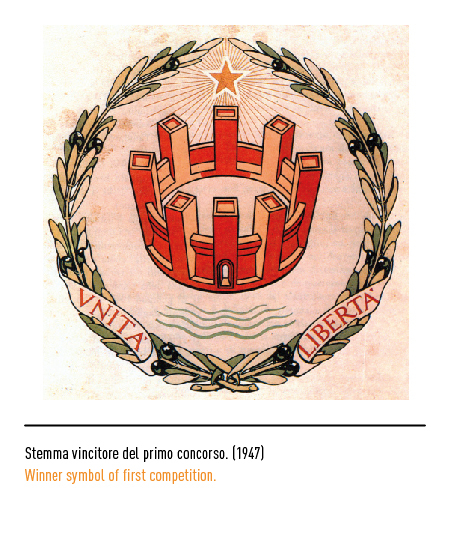 Giovanni Baule, “Il concorso per l'innovazione dell'emblema della Repubblica Italiana” in Linea Grafica, gennaio 1988, Azzurra Editrice, Milano. 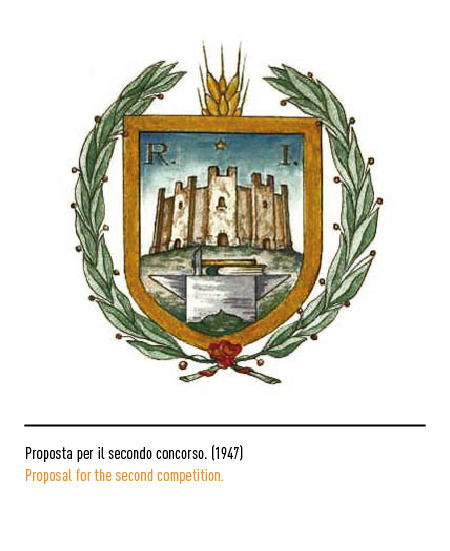 Mario Serio, “I due concorsi per il nuovo emblema della Repubblica” in Archivio centrale dello Stato (a cura di), “La nascita della Repubblica: mostra storico-documentaria,” Roma, Presidenza del Consiglio dei ministri, 1987. 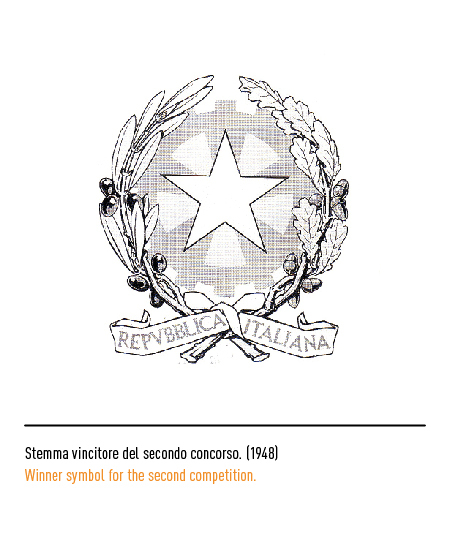 Aldo G. Ricci, “Uno stemma per la repubblica” in Maurizio Ridolfi (a cura di), “Almanacco della Repubblica. 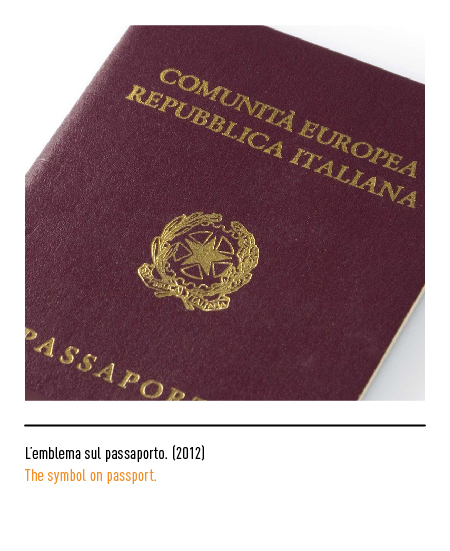 Storia d'Italia attraverso le tradizioni, le istituzioni e le simbologie repubblicane”, Milano, Paravia Bruno Mondadori, 2003. 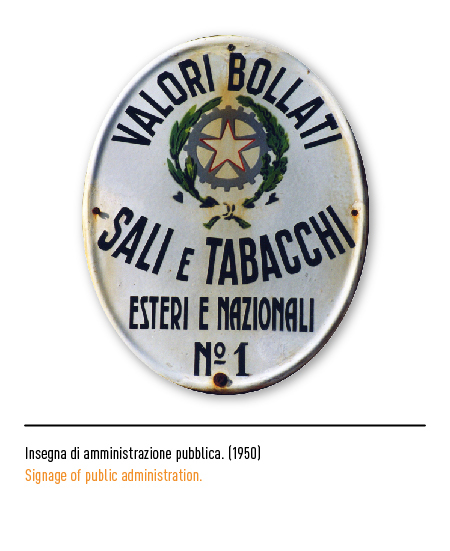 Aldo G. Ricci, “L'inno e l'emblema della Repubblica”, Bologna, il Mulino, 2001.